Facilitated by Allison Galloup, Assistant Professor, Library Science. 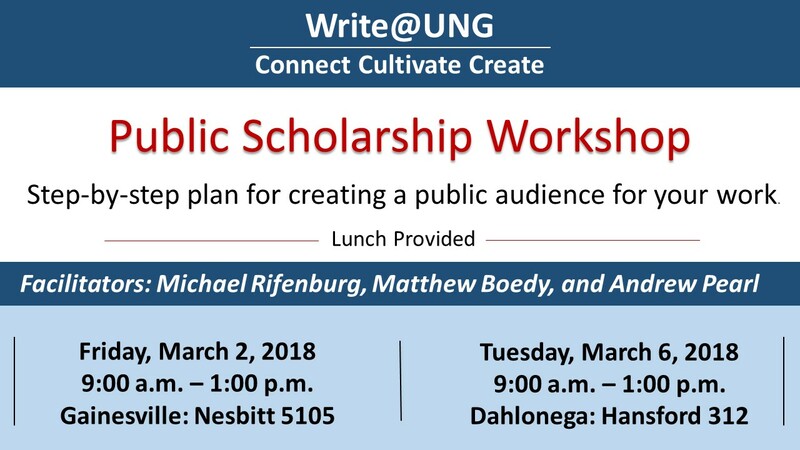 For more information and to register for the workshop, email CTLL@ung.edu. You get an email from a journal soliciting submissions, but you’ve never heard of the journal. What do you do? The journal claims to be Open Access but what does that mean? Should you trust the unknown publisher? Maybe you have seen recent articles about Academia.edu, ResearchGate, or Sci-Hub and aren’t sure what those sites are or why it’s a problem for authors to publish their work on sites like these. The final workshop in the series will examine Open Access publishing and where/how you can publish materials Open Access. 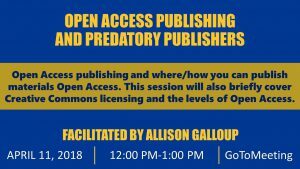 This session will also briefly cover Creative Commons licensing and the levels of Open Access. We will also look at predatory publishers and piracy sites and talk about how you can protect yourself and your work. This session is meant to build on the previous two sessions, but attendance at the previous workshops are not mandatory. 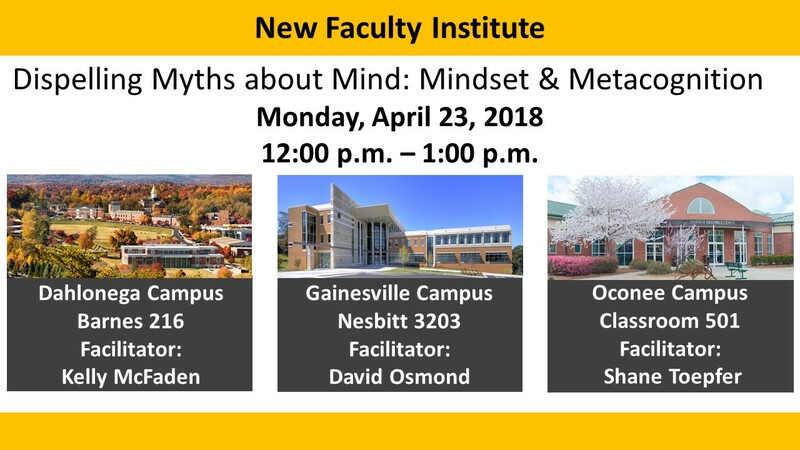 For more information and to register for the workshop, email CTLL@ung.edu. Institutional Repositories: What are they and how can I use them? 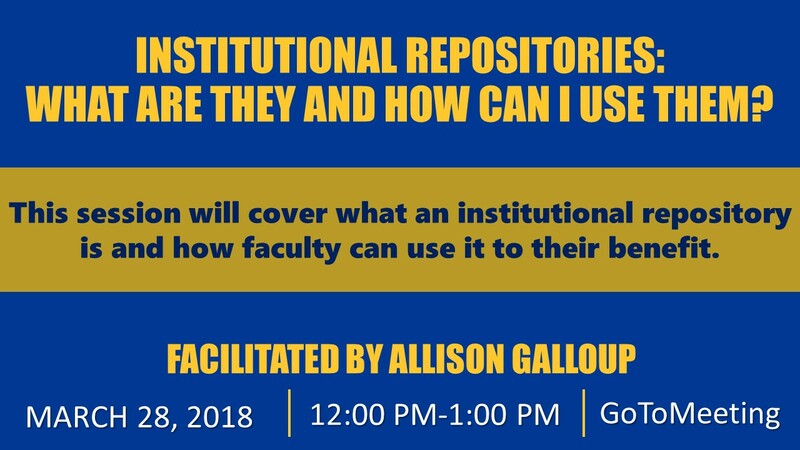 Have you heard the term institutional repository somewhere but weren’t sure what it is? 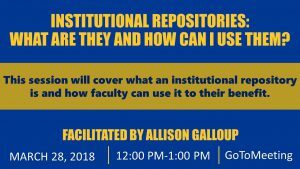 This session will cover what an institutional repository is and how faculty can use it to their benefit. 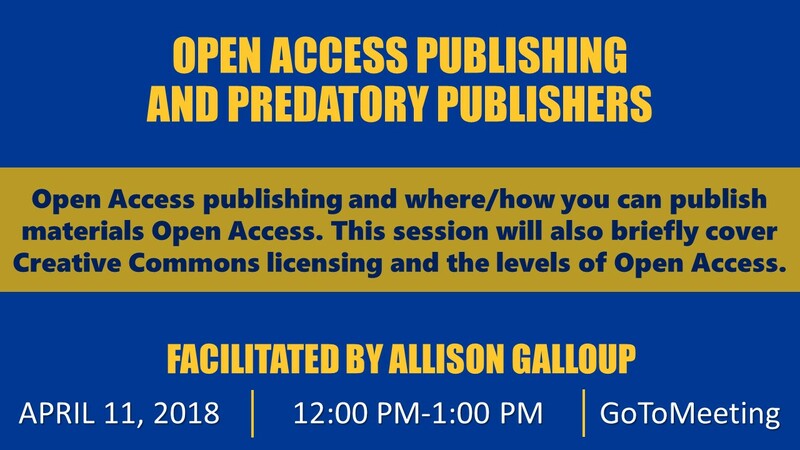 We will also discuss UNG’s institutional repository (Nighthawks Open Institutional Repository), what types of content can be published, and how to post/publish materials in NOIR. 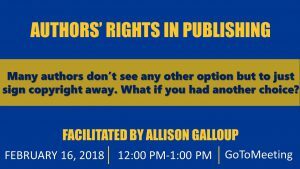 This session is meant to build on the Author’s Right session, but attendance at the previous workshop is not mandatory. Today’s event is in red. Your voice as a professor matters. Inside and outside the classroom. 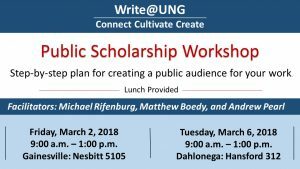 Join two professors who are already doing the important work of public scholarship as they give you a step-by-step plan for creating a more public platform for your work. When submitting an article or book for publication, you are typically presented with a packet of paperwork. A portion of this paperwork will include a contract for copyright. Many authors don’t see any other option but to just sign copyright away. What if you had another choice? 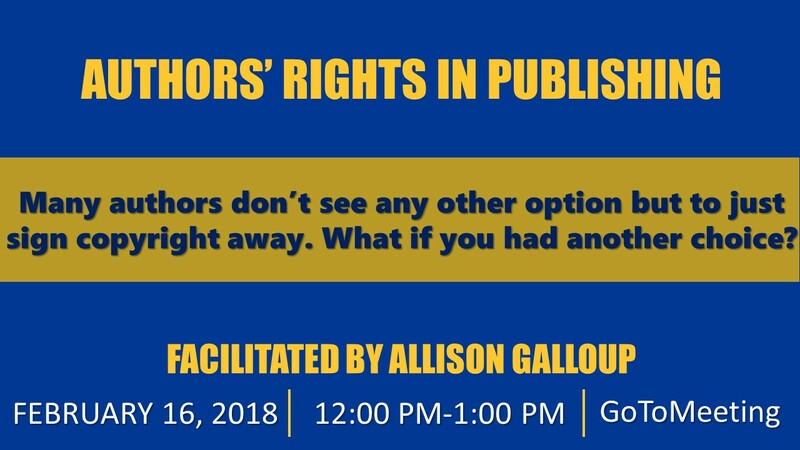 This presentation will address your rights as authors/creators as well as what you should look for when submitting your work to a journal for publication. During the session, we will discuss negotiating tactics for retaining copyright with examples of contract addenda from SPARC. We will also cover “self-archiving” – what it means, how to go about it, and how to find a journal’s policy about self-archiving.